The majority of the setup is done, but I still have lots of things to hang up, some missing border, and that showerboard you see above needs to be Velcroed (Velcrod? Velcro’d??? We need a teacher/blogger spellcheck!!!) to the board. I also have to tackle the rest of my library (not even going to show you that yet!). AND! I have to buy some little elements my sister and I have been planning to make the room more cozy (pillows, plants, etc.). So stayed tuned for a full tour, coming soon!! Ok, I’m off to check out all of the classroom themes/color schemes in Corinna’s wonderful party! What’s your theme or scheme this year?? Thanks Lisa!!! I can't wait to see your pirate theme when you are finished! I don't really use themes in my classroom but I try buying everything in blue/green. Thanks so much Lita! Love blue and green too, they always look gorgeous together! I love the colors..I absolutely love pink and green..Where did you get those cute baskets???? AND why can't I post I need to enter a profile or something…google acct I think I have that..new to blogs but love all of yours! they're old ones from the Dollar Tree–thanks!! Love it! I am also doing a black theme, but with hot pink and hot green accents! Yay! I've been waiting (im)patiently for you to post some pictures of your classroom. It's looking great! My color scheme is black and white with brights (pink, green, and teal). Convenient, no? Keep the ideas and pictures coming!! How do you have your cursive alphabet hanging? Is it on fabric and how is the fabric hanging? It looks amazing! Hey Amanda, it's on black fabric…the fabric was liquid-starched on. Thanks! Where did you get your alphabet? I have some friends that would LOVE that in their classrooms! I love it!! All the bright colors on black looks amazing!! Will you please come and decorate my room?? Can I please ask where you got those cute baskets, they are same colors I am using;) Mahalo for linking up! Hey Corinna! Thanks and thank you for the linky party!! I would LOVE to come and decorate your room–I've never been to Hawaii before! Those baskets are from the Dollar Tree, but they are pretty old so they don't have the same ones anymore–I wish they did! I would buy more, ha! My color scheme is bright green, purple, and chocolate brown. I have a giant green wall in my classroom, but I love purples best, so I want to incorporate that. I'm doing a wild animal/jungle theme along with it. I wish I was using neons so I could steal your design 🙂 haha! 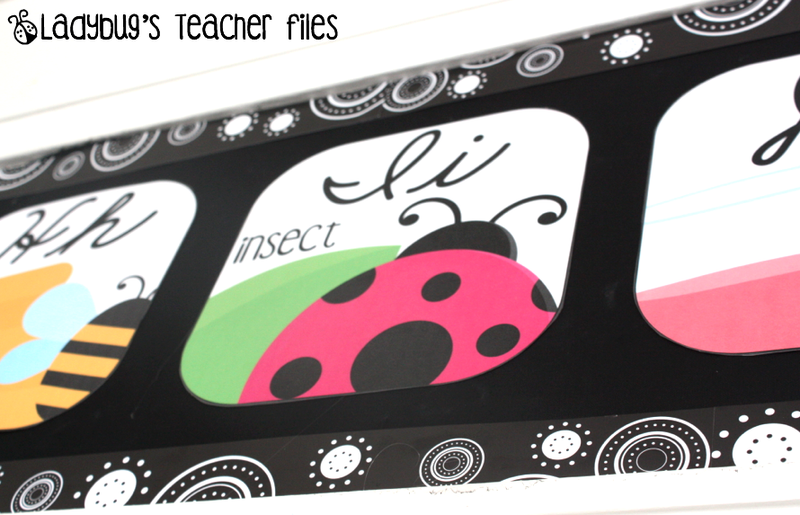 Your classroom is going to be just beautiful! My color scheme is mainly blue and green with brights thrown in – lots of polka dots with an ocean theme. Love your room and the bright pops of color! Gorgeous! Question about the shower board – does Velcroing (Velcro-ing? Definitely could benefit from teacher spell check!) the board to the wall work well? I would like to convert a portion of my chalkboards into whiteboards as well. The previous teacher who had my room nailed it to the board and it looks pretty awful, so I have been searching for other effective ways to mount it. Velcro might be the best solution I've heard! Can you tell me more about liquid starching the fabric on? Also I don't see any staples in the alphabet cards, did you tape them? I am also curious about the lack of staples. With just a teeny bit of hot glue I think. I did a little test and it seemed to scratch off–we'll see at the end of the year I guess! You amaze me every year! Your room is always inspiring! backing your alphabet with black and then bordering it makes it really pop! Great idea! Thanks for sharing and hopefully you can sit back and relax a bit once it is all up and finished! lol, I had everything set up on my bureau before I went in, to make sure it all matched!!! Love! It is looking terrific!! I love your pictures and colors! I never thought to make all my boards background black, I'm loving it! Liquid starch?? For the alphabet, I would love for you to explain that. I'm very curious, since that alphabet is on my wish list for this year. Love your room. It's gorgeous! I would like to get all my colors together like you have. It's so great! Kristen, everything looks fantastic 🙂 I, too, am curious about your lack ps staples. And… Going away? Good for you. Hope you have a nice vacation planned. Hey Elizabeth! I am!! I'm leaving this weekend, I can't wait! I love your color scheme – the colors really pop! I decided to go with a super hero theme this year so I am doing a lot with blue and red. Thank you for such great inspiration! I love the black. It's such a contrasting color and I bet your students work looks awesome on it. I love your classroom! I bought your manuscript letter and can not wait to hang them up. What kind of printer do you have? OK…do you put it on a special setting to make it so clear and bright? Looks FANTASTIC!!! So neat, clean, and organized! Love the black with the bright colors! Love your room Kristen. It looks wonderful. 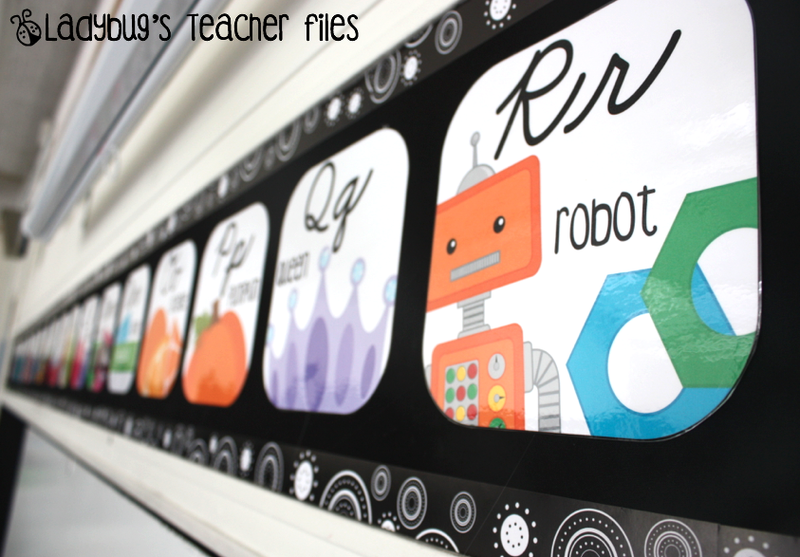 Do you use fabric or paper on your bulletin boards? I love your room, Kristen!! I'm so jealous that you're almost done– I can't start until mid-August!!! OH MY Gosh! Kristin! I love every stinkin' piece of it. It looks so good. I am especially jealous of the alphabet. We HAVE to use what came with our curriculum and it is UGLY. Your room looks so cute Kristen. I love the color selection. Unfortunately, this year, we can't get back into our rooms until about 6 days before the kiddos start. They are doing asbestos tile abatement in our building so we will all be working like crazy trying to get our room set up. I would love for you to visit my blog. I bought your thistle girl alphabet set for this year. I am doing a rainbow theme and cut rainbow colors to put behind each of the circles. I can't wait to put it up. Have fun on your trip! In awe right now Kristen! LOVE-LOVE-LOVE ! and.. That alphabet rocks girl.. Does your school always let you come in and set up so early? We can't go in until a week before school starts..I haven't even thought about this years theme yet! How did you make your curtains? Looks awesome. Hey Melissa, thanks! We can come in whenever our rooms are ready, so I went in extra-early this week (leaving for vacay next week) to get it started. I would be anxious if I had to wait too long–I'm sorry! But it's also probably a good thing, to take a long break from the classroom. i love your black shade…did it come that way or did you cover it black. id love to hear some creative ways to use pull down shades. also can't waita to hear your liquid start explanation. thanks for your inspiration. It's actual a vinyl decoration sheet from a party store–it's called a Scene Setter. It's hiding not the window, but this boring white paneling behind it. I need ideas for a shades too! I only have one working shades and the hot sun comes through all day! Kristin, your room is gorgeous! I'm so jealous that you are able to work in your classroom during the summer! We have to turn our keys in and get to check them back out 4 days before school starts! I just love all of your decor! It's so crisp and clean and unique! Thank you so much for all that you share, I've learned so much from your blog! I love all the stuff in your room!! It looks so good! I can't wait to see if all complete! I love the alphabet letters. I have graduated but have not found a classroom yet. I have applied to a crazy number of schools, its over 40! But in the waiting process, I have decided to start printing materials I may need if I get that phone call. Where might I find that alphabet set? I love your room! I love how the black fabric pops against everything and looks so clean. We can't get into our rooms until the week before the kids start so I have quite some time to gather ideas. We Rent allowed to attach anything permanently anywhere in the room….how did you get the fabric to stay up? Does the Velcro come off easily? Ugh, trying to do this from my iPad and it's being all crazy…. Anyways, anything we hang has to be able to come down without damaging the walls or board – I mean we use blue tape (painters tape) to hang charts/posters on the walls! Do you have any suggestions on how to cover my boards this year similar to yours? Hi Stephanie! The black fabric is actually attached with a mixture of liquid starch and water and peels off very easily when you need to remove it. I just dunked huge strips of fabric into a bucket of the starch, then draped it on the wall (actually, those are ancient chalkboards) and kept smoothing it out with two hands. You might need some help if you put up larger pieces…with smaller ones you could do this yourself. I didn't peel mine completely off because I was allowed to keep them up from last summer. But a couple of corners had peeled back a bit and didn't seem to leave any residue. I hope this is of some help! I love this idea!! I'm moving into a room that has this one random chalkboard! Thank you for your continuous inspiration to all! I hope you're enjoying your vacay! I am also doing black, white, and neons! I love your pictures. I can't wait to see more. 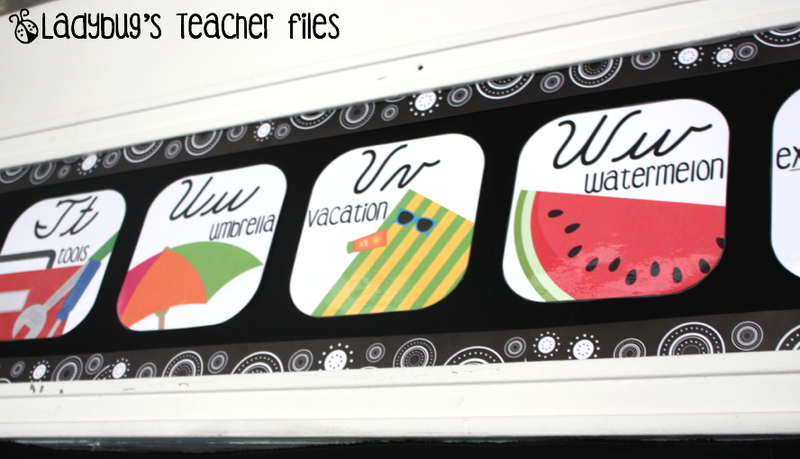 I'll definitely be using some of your ideas when I get into my classroom in August! Thank you for the ideas. 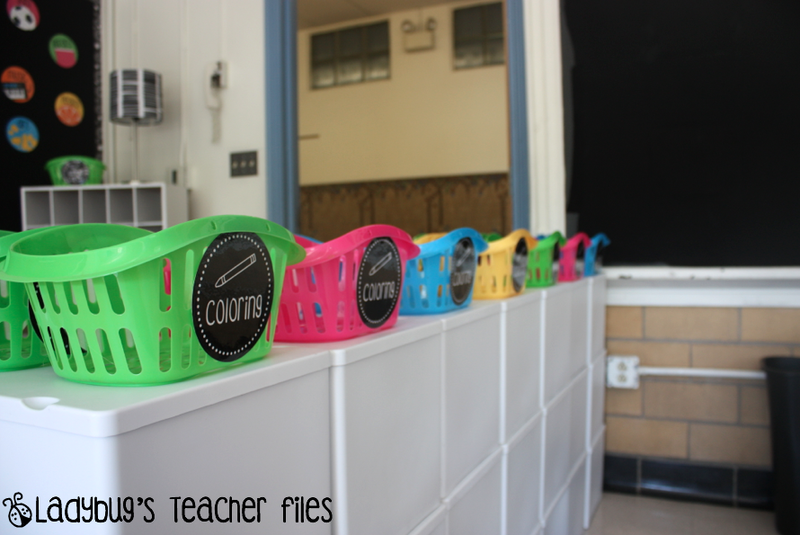 Where did you find the chalkboard labels for this year's baskets? Love your room! Hi Kristen, I love your room! I'm teaching middle school this year, so I am trying to think of a theme/colors that will not be too "babyish" for them. I was checking on the CTP black and white stuff as well! It looks so sharp on the black background! Have you ever had any problems with fire inspectors? They come through all of our classrooms and write up throw pillows, chair cushions that are not tagged correctly, etc. They are very nit picky. We get a slight warning right before they come and I usually try to put some things in the trunk of my car for the night. I wonder if they'd get me for fabricing a wall. I love your room! It is adorable…:) My color scheme is almost the same as yours….except I am using orange instead of yellow. I can't wait to get in my room and get started….should be next week sometime! I'll be posting pics so be sure to come check them out! I LOVE your website! You have lots of cute ideas. I was wondering where you got your cursive letters. I have been looking for a new set. I love your room!1 Very bright, cheery as well as crisp & clean. Just like the poster ahead of me, I would love to know where you got the alphabet. I love them. The only problem I have is that I teach pre-k & would need print. Do they come in print? Hi Marina and Susanne! Thanks very much! The alphabet is in my Teachers Notebook shop, I have a few different versions 🙂 Thanks again! 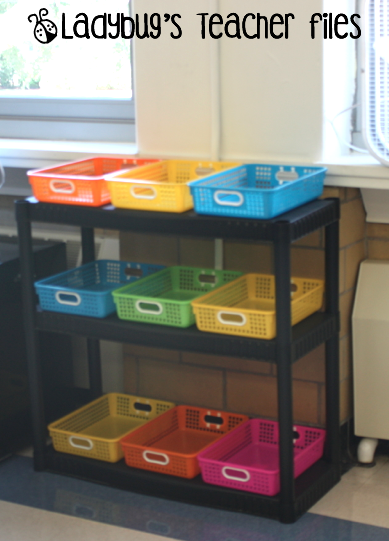 Your classroom is super cute and very organized! Typically, I'm not a "theme-y" person, BUT this year I'm using Apple Green and Black, and I'm going nuts finding sooooo much cute stuff!! I am completely jealous you are able to work I your room already. We don’t get to till 2nd week in August and we start the 20th. I graduated in December and am still waiting for a teaching position! 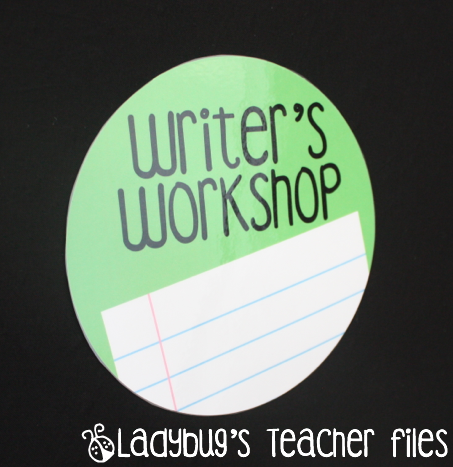 Your blog makes me so anxious to get into a classroom and get busy! It looks amazing. Good job! Maybe a silly question…what kind of fabric do you use?. Hi Kristen! I was thinking about doing the fabric starched walls, but I am in a room with no windows and deal with occassional humidity,dry heat, and cold air from the vents! Do you know if this stays up in a windowless room? In other words, do you know any other teachers who use the fabric walls under similar conditions? Lastly, where did you find your borders in such great colors? Any answers are greatly appreciated! Your blog ideas are in my top 5 of all time! Kudos girl (and to your sister)! Hi Tara! I'm honestly not sure about a windowless room–I don't know of anyone who uses fabric in those rooms in my school. My room does get very humid (we don't have AC) and they stay up fine. The border I found online. I can't remember which store, but I think it's called Black and White Crazy Circles (or something like that!). Where did you get that lamp with the black and white shade? It would look gorge in my seuss room! The zebra one is from Walmart…the older one in my photo with the stripes is from Target last year. Thanks for stopping by! Have you all ever heard of Seal and Peel? It is a caulk and works great. At the end of the year I just peel it off my cupboards, brick, windows cinderblock~ Was wondering if it would work on the shower board as I was thinking of converting a B Board. My colors are blue with B&W boarder ( I have the same ones you have 🙂 with a green boarder and some bright colors! Hey Kristen!! 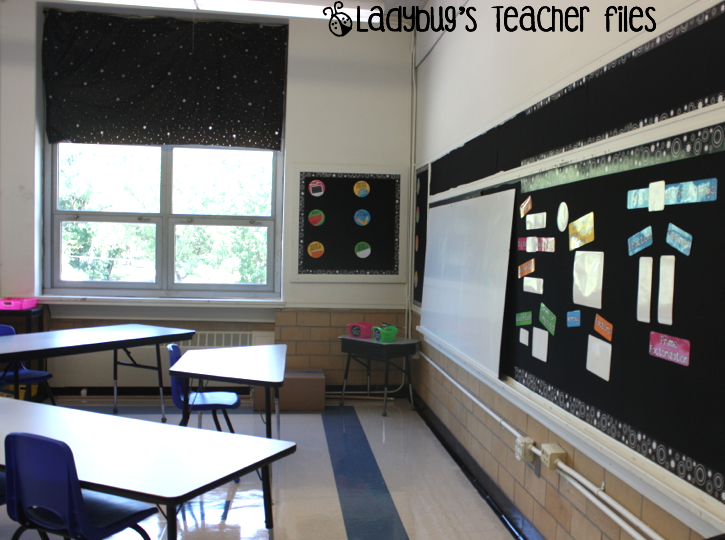 I was playing around in my classroom with some black bulletin boards and neon pink, green, blue, and purple pops of colors today and I knew I had to come to come check out your classroom pics since I originally fell in love with bright on black color concept after seeing your room last year. Your latest update looks gorgeous!! I love the way you use different shapes and how they pop so vibrantly off the black backgrounds. The alphabet it probably my favorite of all time! I just purchased my fabric at Hancock & headed to WalMart for the liquid starch. Can't wait to see the results! I already had the same border, so I'm excited to try this! I love your ideas. Can;t wit for my room to be ready for me to get in. It was flodded 2 wks ago and we have at least 2 more wks. We r now in library! I am a first year teacher. I have been busy setting up my room and was wondering where the alphabet signs with cursive writing came from. That would complete one component required for my classroom. I may also add that I love the way it looks. Hi! Thank you! They are in my shops (there are some different handwriting options). Thanks again and best of luck with your first year! I love the black fabric I put up in my room! I purchased the flipped schedule signs too. What do you put up to show the time for each subject? Hi! The time for our specials is the same each day and that's with our schedule. I will cut out some bright letters to put the days of the week for our specials, once I know our schedule for them. Thanks so much! 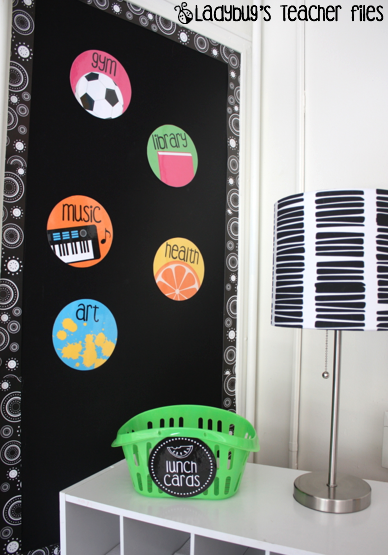 I just keep going around my room changing everything…crazy, because I'm in my first week with kiddos! I do love the black with the bright colors! Do you have your alphabet in a file to share? I purchased your cursive alphabet and really like the "cheer" factor it adds to my 3rd grade classroom. Do you think you could update it with the words written in cursive? Since the students are anxious to learn cursive, I thought the labels should provide a model for them.